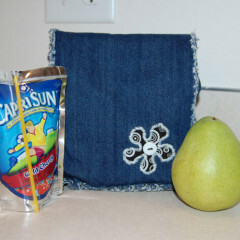 I love these reusable lunch bags! When I started my new job, I needed a lunch bag. Of course I waited until the night before to even think about making something, but I found this great pattern at Emma Mae Pattern Designs. It’s called the Raggedy Lunch bag and I just adore it! 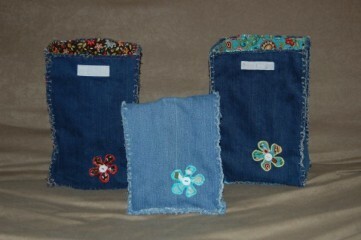 The first three I made (pictured above) were for my daughter, my niece and myself. They were made of out old blue jeans my husband was getting rid of, and scrap fabric on the inside. They were so darned cute I got some denim and cut out more to make. The first two of those are in the store already under Lunch Bags, and there are more to come. As I was getting the link to her store for this post, I saw that Emma Mae now has a Classic Lunch Bag that I am loving just as much and I think it’s a little more boyish… I might need to start making those, too.